California is a place where people come to reinvent themselves, and that is especially true of Los Angeles, a sprawling city of dreams. That same creative spirit applies to local Judaism, which thrives in both traditional and myriad do-it-yourself versions. With a Jewish population estimated between 550,000 and 600,000—the second largest in America after New York—in a metropolitan area stretching from the Pacific Coast to the edge of the desert and from the city center (or what passes for it) into ever more distant valleys, there are lots of possibilities for self-expression in Jewish religious beliefs. Los Angeles was founded as a Spanish pueblo in 1781, and 60 years would pass before the first known Jew—German tailor Jacob Frankfort—arrived with other pioneers. Photo courtesy of the temple archives. Frankfort disappeared briefly from local records, but by 1850, when Los Angeles was incorporated as a city, he was one of 8 Jews out of 8,624 souls. The other 7 were German or Polish merchants, and over the next decade more European Jewish traders trickled into town, determined to make their fortune in the rough, dusty outpost. There were enough of them in 1854 to form the Hebrew Benevolent Society—the first charitable group in Los Angeles—and a year later to pay one dollar to the city for three acres of land to create a Jewish cemetery in Chavez Ravine, today’s Dodger Stadium, which is marked by a plaque as the first Jewish site in Los Angeles. The growing community took an active role in the civic and political life of the city. Merchants became bankers, prospering and suffering in the cycles of boom, bust and recovery after the Civil War. In the 1890s, a new wave of traditional East European Jews entered the mix, not particularly welcomed by their already established, assimilated brethren. The numbers exploded as immigration to the United States grew: In 1900, 2,500 of the city’s 102,000 inhabitants were Jews; two decades later there were 20,000, mostly from Eastern Europe (by way of East Coast as well as Midwestern cities), many of them Orthodox. Among the newcomers were tuberculosis sufferers who sought a healthier climate. Los Angeles Jews responded in 1902 by organizing the Kaspare Cohn Hospital—which eventually became famous as Cedars-Sinai Medical Center—and a decade later built another sanatorium that is now the City of Hope hospital. By 1930, the city’s Jews were more numerous—70,000 out of 1.2 million—and more diverse. Boyle Heights, east of today’s downtown, had a distinct Yiddish presence, while south Los Angeles had a burgeoning Sefardic community. And a few enterprising Jewish businessmen had arrived on the West Coast to make movies in sunny Hollywood: Carl Laemmle, Adolph Zukor, William Fox, Louis B. Mayer and Harry and Jack Warner became the moguls behind Universal Studios, Paramount Pictures, 20th Century Fox, MGM and Warner Brothers, launching an industry that continues both to fuel the local economy and kindle dreams worldwide. After World War II, California was flooded by ex-G.I.s seeking peacetime prosperity; Jews joined the tide, increasing from 168,000 in 1946 to about 330,000 by 1951. They moved into new subdivisions in the San Fernando Valley, to the established neighborhoods of the west side and to coastal Santa Monica and Venice. Though the moguls were gradually ceding control of the movie studios, Jewish stars—with not very Jewish names such as Tony Curtis and Shelley Winters—still filled the silver screen. By the 1960s, members of the community also worked in insurance, construction and the clothing and furniture industries; filled the professional rosters of lawyers, doctors and teachers; and were active in politics and philanthropy. Recent Jewish immigration has added new textures to what has always been a multiethnic city. Israelis, Russian Jews and Persian émigrés have arrived over the last 20 years, organizing their own shuls, creating shopping districts, altering the look of the streetscape and reinventing Jewish Los Angeles once again. According to estimates, there are about 250 Jewish houses of worship in Los Angeles today, though Chabad seems to add new centers almost daily. From storefront synagogues to magnificent temples that welcome 1,000 people on a Friday night, there are Orthodox, Conservative, Reconstructionist and Reform congregations along with those that label themselves Humanistic, Independent, modern Orthodox, Jewish Renewal, Sefardic, Traditional and Gay/Lesbian/Bisexual/Transgender. Even so, most Los Angeles Jews remain unaffiliated, a pattern that dates back to the city’s earliest days. Photos courtesy of the Skirball Cultural Center. The west side of Los Angeles has notable Jewish enclaves in the Pico-Robertson and Fairfax-La Brea areas, and over the last decade Orthodox families have become a visible presence in Hancock Park. A community of Russian and Israeli Jews is centered in West Hollywood. Westwood, Santa Monica, Bel Air and Brentwood have large Jewish populations, as does Beverly Hills, where perhaps 8,000 of the 35,000 residents are Persian Jews. Rivaling them all is the San Fernando Valley (particularly Encino, Sherman Oaks, Tarzana and Studio City), which is home to roughly half the Jews in the entire metropolitan area. Recently, congregations have spread east to the San Gabriel Valley, north to Santa Clarita and west to Conejo and Simi Valleys. That’s a lot of Jewish real estate. Hadassah Southern California serves the entire area with some 90 councils and 15,000 members (310-248-4844; www.hadassahsc.org). The Jewish Federation-Council (6505 Wilshire Bou¬le¬vard; 866-YOUR-FED; www.jewishla.org) is the area’s umbrella organization for Jewish social, educational and humanitarian services. Headquartered in the Goldsmith Center in the Mid-Wilshire District of Los Angeles, it shares its building with the West Coast offices of other national Jewish groups as well as local organizations such as the Jewish Historical Society of Southern California (323-761-8950;www.jewishhistoricalsociety.org). The Federation Valley Alliance maintains an outlying office in the Bernard Milken Jewish Community Campus (22622 Vanowen Street, West Hills; 818-464-3300), a complex that is also home to an active Jewish community center with extensive programs and athletic facilities plus the exhibits of the Southern California Jewish Sports Hall of Fame. Catering to the Pico/Fairfax area is the Westside JCC (5870 W. Olympic Boulevard; 323-938-2531;www.westsidejcc.org), which, in addition to its social service programs, hosts the IKAR spiritual community (www.ikar-la.org), theatrical productions and the Lenny Krayzelburg Swim School (www.lennykswim.com). The Jewish Journal, an award-winning independent weekly, has a Web hub that supplements political and social coverage with lively columns, reader forums and lists of everything from area congregations and schools to kosher restaurants and event calendars. In a category by itself is the Kabbalah Centre (1062 S. Robertson Boulevard; 310-657-5404; www.kabbalah.com), where the teachings draw on a mystical tradition and appeal largely to a non-Jewish (and sometime celebrity) audience. You can chart the historic movement of Jews in Los Angeles with a tour of their synagogues. Congregation Talmud Torah (247 N. Breed Street) moved into an imposing brick building in the heart of Boyle Heights—the equivalent of New York’s Lower East Side—in 1923. The legendary Grauman’s Chinese Theatre on Hollywood Boulevard. Photo courtesy of Los Angeles Convention and Visitors Bureau. With an elegant arched entry and a gracious wooden interior, what came to be known as the Breed Street Shul once held the largest Orthodox congregation west of Chicago. Closed in 1992 and listed on the National Register of Historic Places in 2001, it now sits behind a chain-link fence, awaiting restoration under the aegis of the Breed Street Shul Project (www.breedstreetshul.org). Sinai Temple’s Conservative congregation, founded in 1906, moved to West Fourth Street and New Hampshire Avenue in 1925. That house of worship drew on the Art Deco style; its beige concrete exterior was adorned with a sunburst of stained glass and lovely molded terra cotta rosettes. Today, the building belongs to the Korean Philadelphia Presbyterian Church, while the current Sinai Temple is in Westwood (10400 Wilshire Boulevard; 310-474 1518; www.sinaitemple.org). Oldest of them all, B’nai Brith, a Reform congregation founded in 1862, was renamed Wilshire Boulevard Temple (3663 Wilshire Boulevard; 213-388 2401;www.wilshireboulevardtemple.org) when it relocated to its Byzantine Revival edifice in 1928. 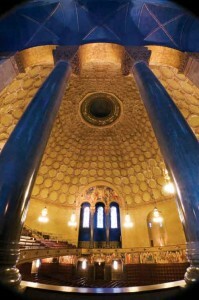 A gilt dome tops the building, which fills most of a city block in today’s Koreatown and even includes a permanent exhibit on local Jewish history. The sanctuary declares its grandeur with black marble pillars, a richly and intricately carved wooden screen above the bima and biblically themed murals lining the walls. Although the sanctuary still welcomes worshipers, Wilshire Boulevard Temple meets the needs of its far-flung congregation with a campus in West Los Angeles and a conference center in Malibu. The Skirball Cultural Center (2701 N. Sepulveda Boulevard, 310-440-4500; www.skirball.org) moved to its dramatic gray granite home in 1996. Designed by Israeli architect Moshe Safdie, the complex combines educational and arts programs with community outreach and a museum collection of some 30,000 objects—from ancient artifacts to ceremonial Judaica, even a reproduction of the Hadassah agenda from its organizing meeting in 1914. 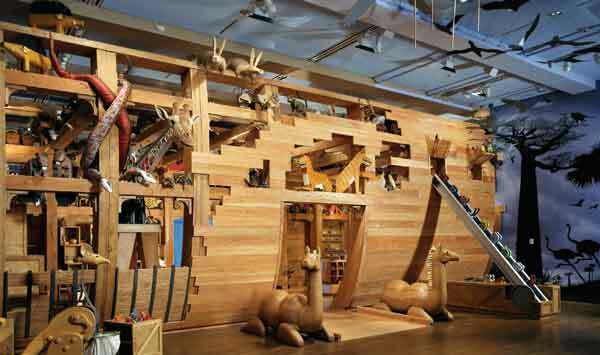 Opened just a few years ago, Noah’s Ark gallery is an interactive children’s hall with nearly 400 life-size animals constructed out of recycled materials. Just across the 405 Freeway is the American Jewish University (formed when the University of Judaism merged with the Brandeis-Bardin Institute), whose offerings extend from undergraduate, graduate and rabbinic studies to the 120,000-volume Ostrow Library, several think tanks and continuing-education programs (15600 Mulholland Drive in Bel-Air; 888-853-6763;www.ajula.edu). The Museum of Tolerance at the Simon Wiesenthal Center (9786 West Pico Boulevard; 310-553-8403;www.museumoftolerance.com) opened in 1993, a year after riots that laid bare the city’s racial discord. Now two permanent exhibits explore issues of diversity and racism through innovative audiovisual galleries. One of the displays is the Tolerance Center—with a re-creation of Simon Wiesenthal’s personal office—which takes the visitor through the events of World War II and the Holocaust. Those days are also remembered at the Los Angeles Holocaust Monument (7600 Beverly Boulevard; www.laholocaustmonument.com), six towering columns of black granite in Pan Pacific Park. 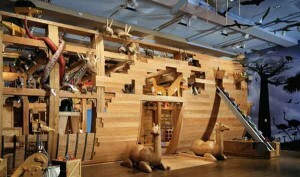 The park is also home to the new Los Angeles Museum of the Holocaust (323-651-3704; www.lamoth.org). 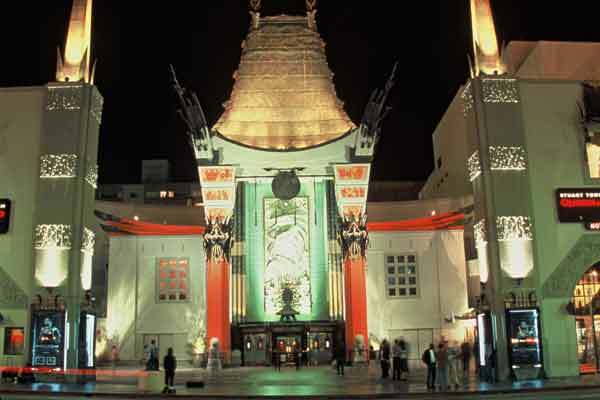 To get a feel for the glitz of Hollywood past, visit Grauman’s Chinese Theatre on Hollywood Boulevard (6925 Hollywood Boulevard;www.manntheatres.com/chinese). Photo courtesy of Weldon Brewster/LACMA. Built by Jewish showman Sid Grauman in 1926-1927 after the success of his nearby Egyptian Theater, the iconic Chinese pagoda-style palace is perhaps best known as the backdrop for over 200 cement blocks autographed and hand-and-foot printed by generations of celebrities—including Jewish stars of the last 70-plus years such as the Marx brothers, Edward G. Robinson, George Burns and Adam Sandler. Old-time moviemakers, ballplayer Sandy Koufax and others from the city’s Jewish past are immortalized in sepia tones on the Fairfax Community Mural, on the south wall of Canter’s Delicatessen (419 N. Fairfax Avenue; 323-650-2030; www.cantersdeli.com), whose Jewish-style (but not kosher) pastrami sandwiches may also be considered landmarks of a sort. A stroll up and down Fairfax will reveal countless possibilities for kosher food, Hebrew books and other Judaica. It’s also fun to explore the Pico-Robertson area, where Persian lettering frequently supplants both Hebrew and English. Visit Elat Market (8730 Pico Boulevard; 310-659-9250) for a step into another world full of exotic spices, dozens of kinds of rice, flatbreads and Persian music recordings. A few years ago, the Los Angeles County Museum of Art (5905 Wilshire Boulevard; 323-857-6000; www.lacma.org) opened the Broad Contemporary Art Museum, named for noted Jewish philanthropist Eli Broad, who contributed $50 million for the spectacular addition. Broad was also instrumental in building the Frank Gehry-designed Walt Disney Concert Hall (111 S. Grand Avenue; 323-850-2000; www.laphil.com), home to the philharmonic; he is also a founding trustee of The Museum of Contemporary Art, or MOCA, where the Geffen Contemporary gallery (152 N. Central Avenue; 213-626-6222; www.moca.org) was named for prominent Jewish Angeleno David Geffen, the entertainment executive. Several galleries highlight Jewish artists or Jewish-themed work: The Bell Family Gallery is located in the Jewish federation’s Goldsmith Center in Mid-Wilshire. 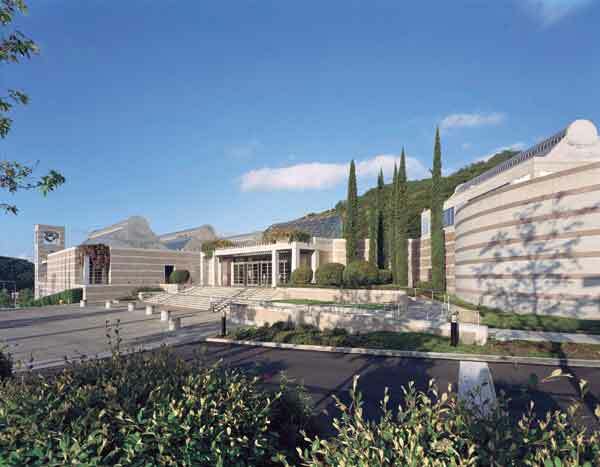 The Finegood Art Gallery is housed at the Bernard Milken Jewish Community Campus in West Hills (818-464-3218). 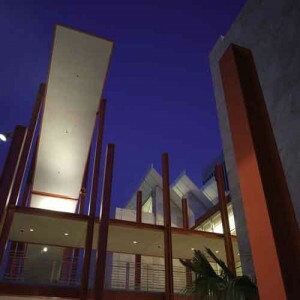 The Hillel on the campus of the University of California at Los Angeles includes the Dortort Center for Creativity in the Arts (574 Hilgard Avenue; 310-208-3081; www.uclahillel.org), with three galleries that rotate exhibits three times annually. For the literati, the Jewish Book Festival (310-440-1246), held in November at the American Jewish University, imports well-known authors such as Anita Diamant and Michael Chabon and presents panel discussions. Movie buffs have the Los Angeles Jewish Film Festival (323-938-2531; www.lajfilmfest.org) in the spring, with venues from Encino to Beverly Hills. And the Israel Independence Day Festival (818-757-0123; www.israelfestival.com) brings out the substantial Israeli community—and other falafel aficionados—to the San Fernando Valley each year for food, entertainment and arts and crafts. A local wag recently wrote that Los Angeles is the premier Jewish city of the 21st century and that he simply assumes that everyone in Los Angeles is Jewish. Certainly the presence of Jews in the entertainment world sometimes makes it seem that way. The most famous may be Steven Spielberg, but producers Jeffrey Katzenberg, Jerry Bruckheimer and Geffen also come to mind. Sumner Redstone of Viacom is less obvious, as are up-and-coming directors Judd Apatow (of comedies such as Anchorman and Knocked Up) and Bob Yari (of Oscar-winning Crash). Actors’ names span the generations: from Kirk Douglas and notable convert Elizabeth Taylor to Barbra Streisand, Dustin Hoffman and Billy Crystal to younger stars such as Winona Ryder, Alicia Silverstone and Jake and Maggie Gyllenhaal. Outside of the film world, Dov Charney, founder of the popular clothing chain American Apparel, is a controversial garment industry figure. In the political arena, Congressman Henry Waxman has represented California’s 30th district since 1974. History of the Jews of Los Angeles (The Huntington Library) by Max Vorspan and Lloyd Gartner remains a classic years after its original publication, as does Neal Gabler’s An Empire of Their Own: How the Jews Invented Hollywood (See all Movie Industry Books) (Crown), a lively group biography of the studio moguls. Meet Me at Brooklyn and Soto is a video documentary of the Boyle Heights Jewish community. F. Scott Fitzgerald used the life of MGM wunderkind Irving Thalberg as the basis for his unfinished novel, Last Tycoon (See all Literary Books) . Budd Schulberg depicted the shamelessly opportunistic antihero Sammy Gluck in What Makes Sammy Run? (See all Contemporary Literature) (Vintage). Focusing on more recent strivers is Slums of Beverly Hills , a film by writer-director Tamara Jenkins, who draws on her own experiences for a bittersweet comingof-age story. Faye Kellerman’s Peter Decker/Rina Lazarus mysteries use the Los Angeles Orthodox community as a backdrop. Meanwhile, Kellerman’s husband, Jonathan Kellerman, authors the popular Alex Delaware mystery series, with his own Los Angeles detective as hero. Beverly Hills provides a good central base: Accommodations there range from the stylish Avalon Hotel Beverly Hills (www.avalonbeverlyhills.com) to the ultra-luxurious Beverly Wilshire, a Four Seasons property (www.fourseasons.com). (9401 W. Pico Boulevard; 323-879-3463; www.shanghaikosher.com). On posh Rodeo Drive in Beverly Hills, a casual choice is A Cow Jumped Over the Moon (421 Rodeo Drive; 310-274-4269;www.acowjumpedoverthemoon.com). And downtown, in the Los Angeles fashion district, Bar-B-Kosher (113 E. 9th Street; 213-623-4955) packs its few tables for a Middle Eastern breakfast and lunch. Farthest afield is Tierra Sur, the elegant kosher restaurant attached to Herzog Wine Cellars north of the city in Oxnard (3201 Camino Del Sur; 805-983-1560; www.herzogwinecellars.com). The breadth and abundance of kosher options is evidence of the ever-evolving shape and identity of Jewish Los Angeles. It is a place, after all, with a strong tradition of change. This article originally appeared in the June/July 2008 issue of Hadassah Magazine.